Люлечные печи "ПОИСК" от производителя ООО ПКП "БАК"
POISK baking ovens are carousel type ones which are used for baking different types of shaped and hearth bread, bakery products, confectionery, small-piece and other products. The use of original design solutions made it possible to create excellent modern tray ovens with low fuel consumption, rapid heating up to operating temperature, a wide range of consumer properties, high reliability which provides broad technological opportunities for expanding the range and quality of baked products. The use of a tray conveyor makes it possible to ensure a good uniform baking of all the products, since the dough products are in the same temperature conditions (there is no temperature difference and the trays move from top to bottom and vice versa). The baking chamber is made of polished stainless steel. Tray ovens are very reliable! This is ensured by the design simplicity and by the fact that all the rotating loaded assemblies are outside the heated zone. We laid a 3-fold safety load margin to the used parts and components! The enterprise uses domestically made components, which allow repairing the ovens promptly and at low cost. We have minimized the overhead costs of the enterprise in order to reduce the oven price. 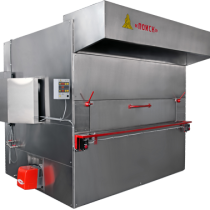 LLC PKP "BAK" produces tray ovens under the brand name of "POISK” and successfully sales them in the territory of the Russian Federation and the CIS countries for more than 15 years. In the production line, there are many models that differ from each other in productivity, type of energy carrier (gas, diesel fuel, electricity as well as a universal model simultaneously using TWO types of energy carriers!!! ), completing units, type of transportation (assembled or disassembled), functional and price, but reliability and high quality always remain at the highest level when talking about POISK tray ovens. There are more details about the manufactured models in the catalogue below. LLC PKP "BAK” can also produce a tray oven exclusively for you according to your wishes, having equipped it with various additional functions for the convenience of work and baking the most exquisite types of products. Details and prices can be specified by phone (8634) 311-832 or through ordering a free call back at a time which is convenient for you, simply by pressing the button "Order a call back" at the top of the page or by clicking on the handset in the lower right corner, leaving your contact phone number if you want to be called back during a few seconds. Our manager will advise you on all issues related to POISK tray ovens. LLC PKP "BAK" provides its customers with reviews from operating bakeries and bread-baking plants on the supplied bakery equipment. We guarantee the quality and reliability of POISK tray ovens by LLC PKP "BAK". The price is from 500 000 rubles, depending on the model, the oven configuration and the quantity purchased.